If you’re anything like me, you are a nonfunctioning human being before the hours of ohhh, let’s say, noon (on a good day). 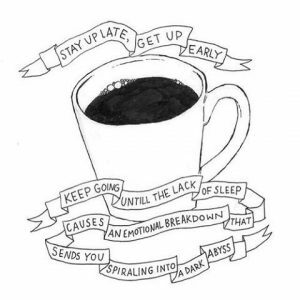 And it is especially worse on the days that you don’t have your much needed caffeine fix. Freshman year at UW, I made the awful mistake of enrolling in an 8 am economics course with Professor Johnson, and although his screaming and running up and down the aisles of the lecture hall were loud and energetic, it was not enough to keep me from doing the infamous head-bobbing that comes along with sleeping in class. Whether you’re an avid coffee consumer like me, or you need your daily does of tea, oatmeal, or even ramen, bringing and actually using my Keurig (rather than getting a coffee from the dining halls or Starbucks everyday (maybe twice a day) was the most indispensable item I brought to college my freshman year. The Keurig is cheaper for all of us college kids ballin’ on a budget. The Keurig is faster and more convenient than waiting in the endless Starbucks line (especially when you’re already 5 minutes late to that nasty 8 am). The Keurig is multifunctional. Coffee. Tea. Oatmeal. Ramen. Easy Mac. The list goes on.